I know it has been a while since I last update. However, last December 2010 has been a rather busy month for me as we had a small party for my 2nd daughter and my youngest brother got hitched on the same month. So, as usual, I made a simple cake for my dearest daughter who turned 8 last December. The cake was a chocolate fudge cake covered in whipped cream. 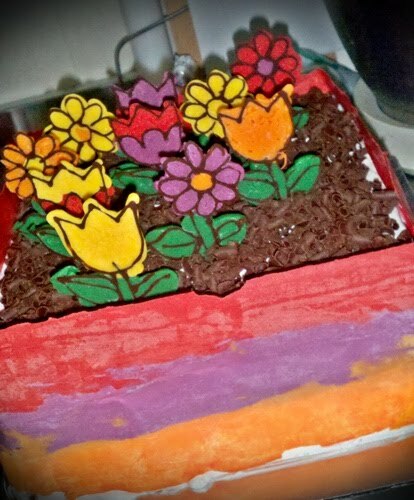 To make it look interesting and fun, I used the chocolate transfer method and came out with this flower cake. I am happy that birthday girl liked it. It was fun though making this. The week after the birthday week, my brother got married and he wanted me to make a cake for his wife as a gift. 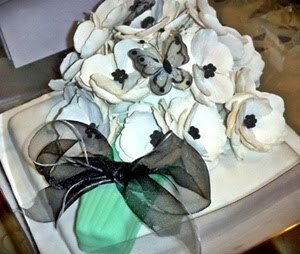 I had some gumpaste flowers which I ordered but did not have the chance to use it. It much googling for ideas, I came out with this. It was fun making this and very happy with the outcome.